The City of Tshwane's free WiFi project has brought 1.8 million citizens in the capital city online. Project Isizwe has received the World WiFi Day Award, in the category for the most innovative city or government programme, for helping the City of Tshwane provide free WiFi to its citizens. According to a statement, an award in this category recognises cities, governments and organisations that develop local and national plans to bridge the digital divide. Working with the non-profit organisation, Project Isizwe, the City of Tshwane launched its WiFi network in 2013 to create free WiFi hotspots in the city. Since its inception, the Internet project has brought 1.8 million citizens in the capital city online, in the biggest deployment of municipal free WiFi on the African continent, with more than 700 WiFi zones deployed across the city's public spaces. Project Isizwe CEO, Zahir Khan, said: "An award in this category showcases the need for relationship building and partnership with local government in the provision of free WiFi for South African citizens. Just like electricity and water, Internet is a human right, which we are working closely with municipalities to enable." 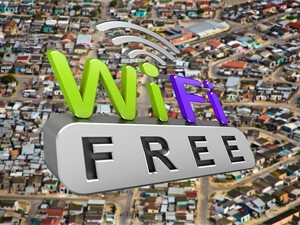 Tshwane mayor, Kgosientso Ramokgopa, added: "Our free WiFi project has radically undermined the adverse effects of unaffordable Internet access by narrowing the hitherto glaring digital divide. "We will continue to be a shining example of what it means to employ the use of technology to lead the way towards a South Africa that is democratic, inclusive, united and prosperous - ours will be the global cyber capital." Project Isizwe was also shortlisted in the category: 'Best WiFi Deployment to Connect the Unconnected in a Rural Environment' for the organisation's Limpopo project.